Chelmno was established December 1941. The first commandant was Herbert Lange. The camp consisted of two parts: administration section, barracks and storage for plundered goods; burial and cremation site. It operated three gas vans using carbon monoxide. The camp began operations on December 7, 1942, and ended operations on March 1943. It resumed operations June 23, 1944, and finally ceased operations January 17, 1945. The estimated number of deaths is 150-300,000, mainly Jews. Chelmno, also known as Kulmhof, was a small town roughly 50 miles from the city of Lodz. It was here that the first mass killings of Jews by gas took place as part of the "Final Solution." The murder process was set up by a "Sonderkommando," under the command of Herbert Lange. He was transferred to Chelmno directly from duties in the T4 euthanasia program, murdering psychiatric patients in Posen. Lange and his unit had developed much experience in the use of gas vans. These early models were equipped to pipe carbon monoxide from cylinders in the driver's cab into the van in which the 'patients were locked. Lange's unit comprised 15-20 men of the SIPO and about 80-100 men of the "Schutzpolizei." They took over a run-down castle in Chelmno and converted it into their base camp with barracks and a reception area for deportees. Each afternoon, Jews were brought under guard by train from Lodz via Kolo junction (where they transferred to open rail cars running on a narrow-gauge track), or from nearer locations by lorry, to the castle or schloss. They were gathered in the castle courtyard, subdivided into groups of 50 and told to undress. They were forced to hand over all valuables. They were then told they were about to be transferred to a work camp, but first they had be disinfected and showered. They were taken down into the castle cellar to a 'washroom' which actually led via a ramp into a waiting van. Vicious beatings ensured that none hesitated or declined to go inside. After 50-70 persons were jammed into the van's freight compartment, the exhaust pipe was connected to an opening in the compartment and the engine switched on. After about ten minutes those inside were dead. The driver, usually a member of the 'Schutzpolizei', then drove the van 2.5 miles into the nearby Rzuchow Forest, to the second camp &endash; the "Waldlager." Here the SS had prepared mass graves, dug by Jewish slave labor, and later cremation pyres. A team of 40-50 Jews, wearing leg-irons to prevent their escape, hauled the bodies out of the van and dumped them in the graves. Another team of Jews sorted the clothes and objects of those killed so that they could be made available to Germans in the Reich. No less than 370 wagon loads of clothing were supplied by these means. The technology was quite simple. The "Sonderkommando" had three vans at its disposal. The only technical innovation was the specially constructed sealed compartments mounted on a Renault chassis. These compartments were lined with tin and had airtight, double doors. The floor of the compartment had a wooden lattice to facilitate the cleaning out of detritus. Beneath it was an aperture with a nozzle to which the pipe from the exhaust was connected. By the time Lange's unit came to use these vans, they had been tried and tested in the "euthanasia program". By these means, about 145,000 people were murdered at Chelmno in the first phase of its operations. Gassings started on December 7, 1941. The first deportees were Jews from surrounding communities and about 5,000 Gypsies who had been incarcerated in the Lodz ghetto. From January 16 to January 29, 1942, 10,000 Jews were deported from Lodz to Chelmno and murdered. They were followed by 34,000 between March 22 and April 2, 1942, 11,700 between May 4 and 15, 1942, 16,000 between September 5 and 12, 1942. 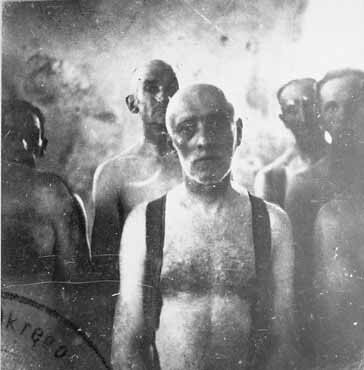 In addition, 15,200 Jewish slave laborers from the Lodz region were gassed at Chelmno. 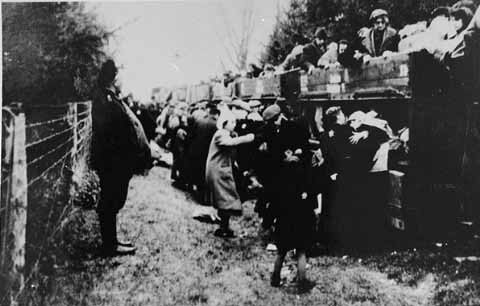 Amongst the deportees were Jews from Germany, Austria and Czechoslovakia who had been transported to the Lodz ghetto. After The Assassination of Reinhard Heydrich and the annihilation of the Czech town of Lidice, 88 children from there were sent to Chelmno and murdered. By March 1943, most of the Jews of the Warthegau had been murdered. Only the 70,000 Jews in the Lodz ghetto remained. Chelmno camp was wound up and the schloss actually demolished. It was briefly reactivated on the same lines in April to July 1944 to assist with the liquidation of the Lodz "ghetto". In this period, a further 25.000 Lodz Jews were murdered at Chelmno. Afterwards, a unit of "Sonderkommando" 1005 labored to clean up the traces of mass murder. On January 17, 1945, the work group, numbering 48 men, was to be shot, but the Jews revolted and in the ensuing melee a handful escaped. There were few survivors of the most intense phase of murder at Chelmno. In mid-January 1942,Yaakov Grojanowski escaped and made his way to Warsaw where he informed the ghetto leadership of what he had witnessed. As a result, fairly accurate information about the mass killings at Chelmno was transmitted via the Polish underground and reached London in June. Altogether, only seven people survived and none remain alive. Sources: The Forgotten Camps; Wesley Pruden, “The last living witnesses; they wore the yellow star and remember the Nazi terror,” Washington Times, (December 12, 2013).